Not every protagonist is a hero! 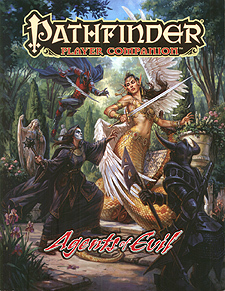 Author Thurston Hillman brings you all the twisted tools you need to carry out nefarious deeds in Pathfinder Player Companion: Agents of Evil. Delve deep into discussions of what it means to undertake evil tasks, both for truly selfish characters and for those hard-eyed heroes willing to get their hands dirty in pursuit of the greater good. Explore new character options for PCs not squeamish about what patrons, gods, or other sources of power they serve, and gear up with a smorgasboard of sinister magic items, forbidden equipment, and spells that will make paladins think twice about working with you. Details on who worships the evil gods of the Inner Sea, and a brief review of their non-evil cults, including the appeaser cleric archetype, who channels nefarious powers to unaligned ends. General and specific tactics for battling the forces of good, from self-righteous paladins to holier-than-thou angles.